The early settler-farmers of New Zealand soon recognized the limitations of the fertility of the land which they farmed, particularly when it came to arable crops such as wheat. In regions such as the Manawatu, the “black soils” of burnt-off bush country at first produced prolific crops, owing to the minerals contained within the ashes of the burnt bush. However, quite rapidly, this fertility declined. But crop rotation was not enough. In England and Scotland, farmers had made greater use of animal manure, but in New Zealand, where farms were too extensive to be fertilised in this way, they turned to chemical fertilisers (also referred to as “manure” at the time). Through the 1880s, superphosphate became a sought-after fertiliser, and remains the most important fertiliser today. The base ingredient of superphosphate is sulfuric acid. But sourcing sulfur posed a bit of issue. One source was volcanic deposits in Italy, but this had obvious disadvantages. 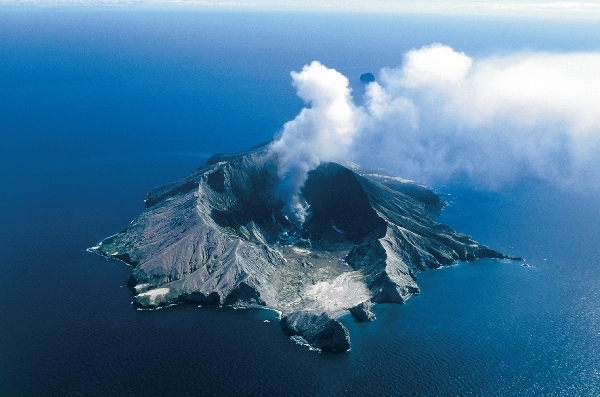 A source closer to hand – but somewhat perilous, as events were later to prove – was White Island (Whakaari), off the coast of Bay of Plenty. When a series of eruptions occurred in 1884, a company, called “The Chemical Manure Company” soon moved in to make use of the sulfur emitted by the volcano for the manufacture of superphosphate. The island’s sulfur deposits were mined by a number of companies well into the 20th century, but not without incident. In 1914, 11 miners were killed when a crater wall collapsed. Today, White Island draws tourists rather than fertiliser manufacturers – with more than 10,000 tourists visit by boat or helicopter each year – and one of the few privately owned volcanoes in the world. Photo top: White Island from the sky. 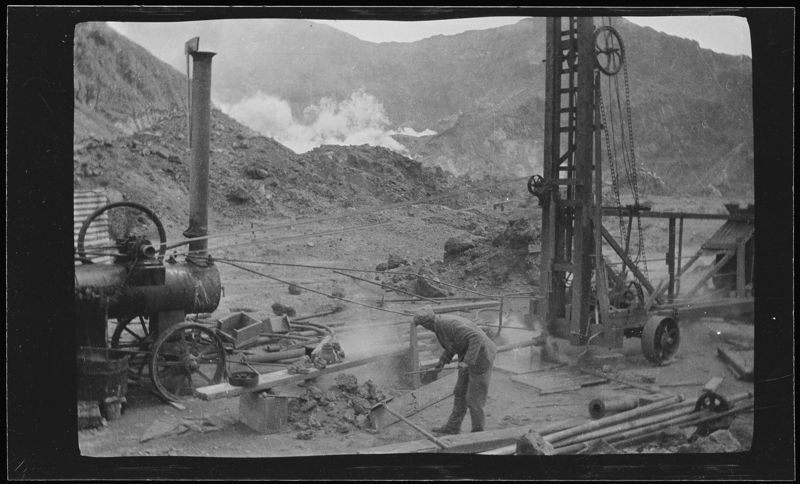 Above right: White Island Products sulphur extraction enterprise on White Island, taken between 1925 and 1930 by an unknown photographer, showing a plant worker in the foreground, and a stationary steam engine driving extraction machinery. Not to be reproduced without permission from Alexander Turnbull Library, ref. ID: 1/4-059931-F.
Another interesting bit of digging! Great photos too.